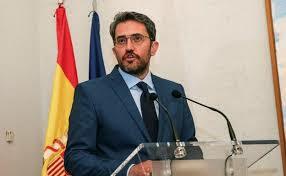 Spain’s new sports minister, who wrote he “hated” sports in a Twitter message eight years ago, said Thursday this was not the case after he was sworn in. “I am not athletic, I say this because of everything that has emerged, I don’t like to practise sports, but I love sports,” Maxim Huerta, an award-winning author who is also culture minister, told reporters after he took his oath of office. “That doesn’t mean anything. I will support and love sports and support all athletes because they are heroes and heroines,” he added. In Twitter message from April 2010 uncovered after he was nominated on Wednesday to the post in a surprise move by new Socialist Prime Minister Pedro Sanchez, Huerta said he “hated” sports, adding it was a way to “overvalue the physical”. “Maxim Huerta, a sports minister who ‘hates’ sports,” wrote Spain’s top-selling sports daily Marca on its front page on Thursday. Before being sworn in, Huerta has already tried to calm the controversy sparked by his old message, writing in a new Tweet that “sports is also education and culture. Sports is respect, dedication, humility, perseverence”. Huerta is one of just six male ministers in Sanchez’s government, which includes 11 women, the most of any administration in modern Spanish history.